It's fair to say, we should have all known. Last year went fast enough, this year is sure to zoom by if January is anything to go by. I remember back when I was a schoolgirl and January would draaag. It was always by far the gloomiest, dullest and dreariest of the months. Fastforward to 2015 and not much has change but fortunately, it was zoomed past. 2015 hasn't quite got off to the start I'd have hoped. My blogging goals have not been met (hello sporadic uploads and only one video upload), my fitness goals have been sporadic (I blame my cold student house) and my general work ethic has been sporadic. Sporadic, there we go, the word that sums up January. It's time for me to knuckle down on my dissertation and other University assignments. Deadlines are looming, and fast. 5th of May, Lucy, 5th of bloody May and you are done! I'm still on the hunt for some fun fitness wear that's flattering and comfortable (was it just me who found the MissGuided Active range disappointing and rather poor quality? I had to send all of my picks back). In the past I've always found a good pair of running leggings, a good sports bra and a slouchy top is the perfect uniform to motivate me into getting fit. I have got a blog post in the pipeline about all of this however I hope February workouts to be more consistent. Yet again, I seriously blame my freezing cold University house where the heating comes on at ridiculous times of the day, leaving me feeling cold and unmotivated to move. It's time for me to get a bit more adventurous with my cooking. I really want to put all of my cookbooks to test and experiment with different flavours and ways of cooking. Now that all of the Christmas chocolate has gone, it's time to get back on track and stick to wholesome snacks to keep me going throughout the day. I've got a couple of recipes I really can't wait to share with you, plus a few I need to experiment with so keep your eyes peeled. Think salted caramel, peanut butter and dark chocolate aka my favourite flavours ever. I also hope to experiment more with my beloved Nutribullet. I purchased some Lucuma and some Wheatgrass today (bloody hell were they expensive) so hopefully they'll encourage some new and inventive creations. Plus I need to step away from the same old green smoothies and instead play around some more. To be honest, I'm actually pretty pleased with how I've been with my money this past month. I've only really purchased what I needed, even if they were skincare/make-up/clothes items. I intend on locking away some serious savings in the next month too. Food is something I need to budget a bit more as I tend to buy as I go along throughout the week and forget how much I'm actually spending. Oops. This goes hand in hand with my cooking hopes and hopefully through some careful meal planning, it'll mean spending a little less on certain ingredients. Gosh, it actually saddens me how sporadic (that word again!) I can be when it comes to blogging. If you saw my blogging book you'd be amazed that I'm not posting every day! I think I just need a shove up the bum and just get on with it really. It's a weird old thing blogging, you never quite know who it's going to reach and when you suddenly get a comment on a post, it all gets rather exciting. I'm very proud of a lot of the content from the past month, nonetheless. Like I said, I just need to bloody well get on with things and remind myself why I'm blogging. I think i've got so much to say I just don't know how to say it! The same with my YouTube videos. You'd be surprised how much you stumble and bumble over your words the second a flashing camera is plonked in front of you. Off camera I've made tonnes of amazing videos having just sat there and 'pretended' I'm talking but in all honesty, once I hit record something comes over me and I'm suddenly not me. I'm sure it takes practice and getting used to, however I think I just need to imagine the camera is my Mum or James or someone! Again I've got tonnes of video ideas it's just getting past that hurdle of pretending the camera isn't 'really' there I need to get past. How's your January been? Do you have any goals you want to achieve throughout February? As always, let me know as I'd truly love to hear from you. 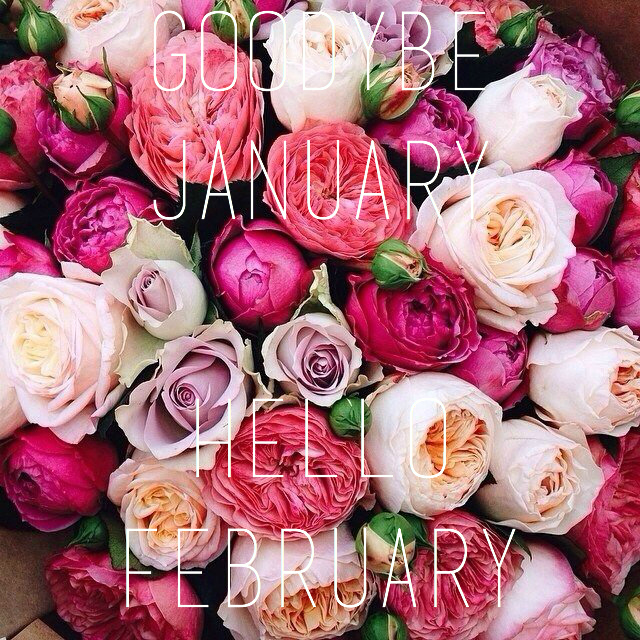 I was a pretty sporadic blogger in January too, here's to being on top of it in February! I love your blog and nominated it for a Liebster Award!